It is a hot, sunny day and the trails are bone-dry. Standing outside the Radisson Blu Hotel, cycling guide Robin von Braun is ready for a ride. He is going to meet two keen mountain bikers who have booked a two-hour tour with Trysilguidene. Steve Glazebrook and Johan Persson are looking forward to covering new ground today. After a chat with Steven and Johan, Robin knows which level they're at and has an idea of what kind of biking experience they are after today. Based on this information, he proposes cycling eastward. They will cross the Trysilelva river and bike through the centre of Trysil. From there, they are going uphill. 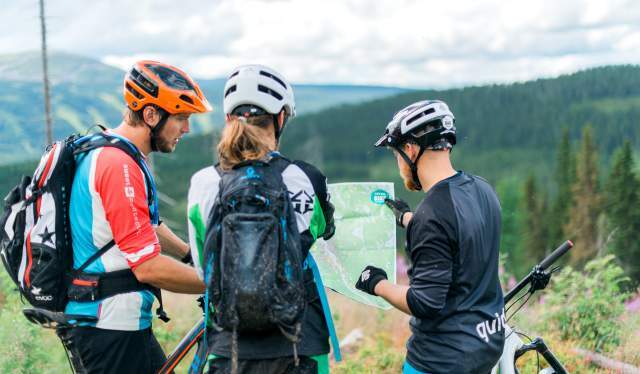 “We are going to ride up Bergvegen towards Ås and go around Bjønnåsen, where there’s a great descent with lots of flow that will fit these guys. We can choose to go down along Ljørdalsvegen or Gravavegen. Today, I think that Ljørdalsvegen is our best choice. It is quite technical, which will be a good challenge for them”, Robin concludes. Steve and Johan have quite a lot of previous cycling experience. But they are open to suggestions, tips and tricks from the guide – the more they learn, the more fun they will have. Every once in a while they stop, get off their bikes and discuss the terrain. Back at the hotel, Robin recaps the trip. The guys are happy, but they are far from finished for today. As soon as Robin has pointed out a few more trails on the map, they are back on their bikes and wave goodbye as they're off on a new MTB adventure. From Bjønnåsen and down Sponbergvegen (number 96) to Skumlesvingen (number 84). This trail has a bit of everything. It starts off easy and allows you to work up a lot of flow and speed, and at the end it is very technical. Along the way you will pass large rocks and roots, and it is pretty steep in places. Bring a backpack with water, a spare bike tube, maps, a first aid kit and energy snacks or something else to eat. Trail riding is great as a social activity. Bring some friends along! Remember to charge your mobile phone fully before you set out. You will need it to take pictures, of course, but it will also come in handy if you need to call for help. Feel free to share your pictures on social media under the hashtag #trysilbikearena. 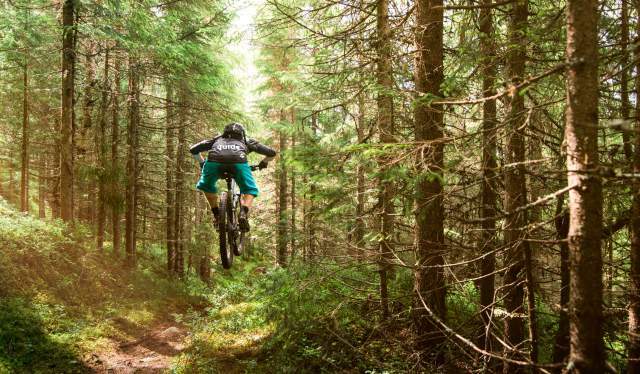 Read more about cycling in Trysil.